Relatively Sane: Relativity Series, Book 2 is a contemporary humorous women’s fiction novel written by Whitney Dineen. While this is the second book in Dineen’s series, she provides sufficient background information for it to be enjoyed as a standalone novel. Cat Masterton grew up wishing she had a normal life, complete with normal parents -- preferably well-to-do ones who rode in a Lincoln Town Car. But no, she lived in a ramshackle farmhouse with a dad who had a penchant for mounted animal heads and preserved mice, and wore his kilt to her school functions with depressing regularity. Cat had left her Illinois roots and fled to the glitter and urbanity of Manhattan’s canyons as a new adult, but found herself suddenly inexplicably, back at home and with her high school sweetheart once again. And, she was actually getting ready to buy that old farmhouse from her parents. They would be moving to a smaller place in town, which suited Cat quite well, if only she could get them to take all their belongings with them, including the pet cemetery of preserved animals she was stunned to hear were silently moldering away up in the attic. Nan would be staying with Cat in the farmhouse. Cat figured Nan would be moving down into the lower floor digs Cat was currently inhabiting. But one never knew what Nan had in mind, and basically anything she did have in mind was more than likely to happen. 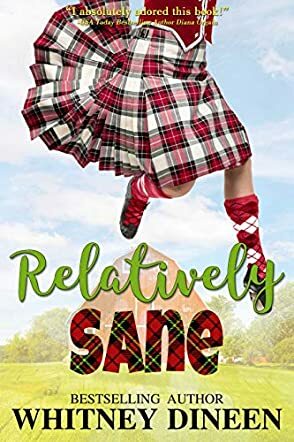 Having read the first book in Whitney Dineen’s hilarious Relativity Series, Relatively Normal, I was looking forward to reading this second offering in the series, Relatively Sane. My expectations for more fun times with Cat Masterton and her quirky family were not at all disappointed. Dineen hits the ground running with this follow-up book. Watching the family as they work through the housing transfers, and seeing how Nan’s suggestion that Cat contact a TV renovation show yields some surprising results, is grand entertainment. The author’s plot is satisfyingly rich and sumptuous, and her characters just keep getting more complex and fun to be around. Being a part of the Masterton clan, albeit vicariously, is just one of the reasons this well-written and enjoyable book should be on everyone’s reading list. Relatively Sane: Relativity Series, Book 2 is most highly recommended. All her life Cat has been trying to get away from her family, but finally over Thanksgiving and with her grandmother suffering a brain bleed, she realizes that family is relative, and to embrace what you have. To do that, Cat broke up with the safe and stable Ethan, went back to her high school love, Sam, and bought her parents' old farm with plans to turn it into a destination wedding venue. To accomplish this on a budget, Cat applies to a reality TV home improvement show featuring two brothers who do renovations. Having the TV crew around brings out some of Cat's old fears about her family being crazy, and puts stress on her and Sam, and she can't figure out why. Relatively Sane is a look into the crazy thing we call family, always there for you in the end. Author Whitney Dineen draws on current events and people to make this story engaging to a variety of readers. Relatively Sane is the second book in the Relativity series, and although I did not read book one I was not lost in any way. However, I am curious as to what occurred in the first book. Author Whitney Dineen has taken popular television personalities in reality and created them in the book, which makes the story all that much more relatable. It feels like it could be about any person you pass on the street today. Although Cat's family touches on all sides of issues, everyone has felt at some point in their lives that their family is crazy and they don't belong. This book embraces the uniqueness of each family and says embrace it, hold on the value of family, no matter what they are like, and make something special of it all. This is an important message in today's culture. This looks to be a cute and touching series. Relatively Sane by Whitney Dineen is Book 2 of The Relativity Series. There is nothing normal about Cat Masterton’s family. Her parents have sold her the family home so she can make a go of her wedding planning business. With a barn conversion in mind, she gets in touch with House to Home Television’s Renovation Brothers and is stunned when they accept her onto the show. Now the fun really begins. Two drop-dead gorgeous men. There’s bound to be a clash between them and Cat’s boyfriend. And why is the show’s producer, Ashley, suddenly acting weird with Cat? Her boyfriend is acting strange, odd things keep happening all over the house and Nan is just being ... Nan. Will it all work out for Cat? Or will she run screaming back to New York, wishing she’d never come back? Relatively Sane (Relativity Series Book 2) by Whitney Dineen is a hilarious story. It's got comedy, drama, love, confrontation and more with some fabulous characters. I did not read the first book in the series but I fell into this one very easily. There are a few references to the previous book that help make things clearer so you could get away with reading it as a standalone book – not advised with a series though. The characters were just wonderful, developed so well and so realistically that I could picture them in my mind as I was reading. The story itself is a funny, well-paced tale set in a quirky town with a dysfunctional family – I so wanted to be there! Fabulous story, really funny. I will definitely be reading the first one in the series now and I hope there’s going to be another.